Radiological and Nuclear Detection | PSI - Physical Sciences Inc.
PSI extensive experience in the development of advanced background clutter suppression for small signal extraction in hyperspectral imaging led directly to our work in the standoff detection of radiological and nuclear materials. 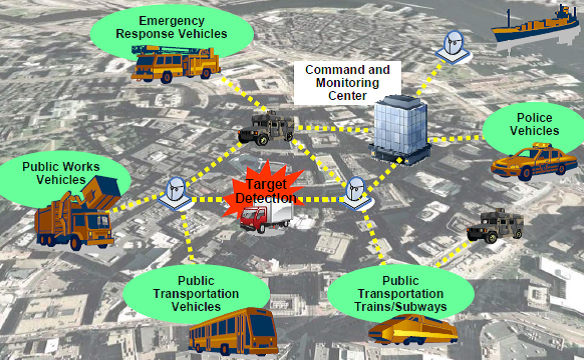 PSI’s initial work in this area utilized forms of Bayesian reasoning, coupled to a classical detection model, to assess the probability of detection of a radiological source in an urban environment using an ensemble of conventional detectors mounted on transit busses and police vehicles. These models were incorporated into a simulation tool developed by Raytheon to design these detection networks. The inadequacy of the classical radiological detection algorithms led to PSIs development of the Poisson-Clutter Split (PCS) algorithm. This algorithm was developed for the detection and identification of radioactive sources embedded in diverse radiological backgrounds. The key innovation of PCS lies in: 1) the use of a novel, nonlinear probabilistic representation of radiological backgrounds, 2) accurate modeling of gamma counts based on Poisson statistics, and 3) the use of the Generalized Likelihood Ratio Test (GLRT) to simultaneously perform isotope detection and identification. The PCS algorithm has been applied to detection systems ranging from hand-held radioisotope detectors, standoff radiological imaging systems, and vehicle portals. The performance of the PCS algorithm for handheld isotope identifiers has been assessed using data sets collected with a RadSeeker medium resolution detector developed by Smiths Detection. The capability was evaluated by passing by containers inside which several check sources were embedded. The results of the on-the-move tests demonstrated the detection and discrimination capability of the PCS algorithm in conjunction with low-count spectra produced by medium sensitivity RIIDs. The performance of the PCS algorithm can be attributed to the use of an accurate statistical model to extract information about the source from spectra dominated by Poisson noise and collected in diverse environments. These tests demonstrated that integration of the PCS algorithm with state-of-the art RIIDs provides detection sensitivity enhancements, while enabling real time threat identification. The PCS algorithm performance has been validated against field data acquired by the ground-based Standoff Radiological Detection System (SORDS) developed by Raytheon and referred to as the Trimodal Imager (TMI). The high sensitivity of the detector package utilized in the TMI system results in a reduction of randomness due to stochastic decay events. The success of PCS algorithm in this application is attributed to the effectiveness of the background clutter model, which enabled high sensitivity detection against low activity sources while insuring mission relevant false alarm rate operation. For the TMI application, the PCS algorithm, while operating at lower CFAR conditions, has demonstrated a factor of 2 - 3 increase in detection sensitivity over other standard algorithm approaches. The PCS integration for real-time use with the TMI system has been an important development in achieving better performance for urban surge and surveillance missions for which the TMI was designed. The performance of PCS in portal applications was demonstrated using the DNDO/Raytheon Advanced Spectroscopic Portal (ASP). The ASP was evaluated with PCS operating using 1/3 of available detectors. The PCS implementation in ASP demonstrated Pd,ID > 90% for a Constant False Alarm Rate of 1 in 1000 occupancies against cargo moving at 30 mph and carrying weak and shielded sources (< 8 µCi). This capability represents a factor of 6 improvement in system throughput compared to what’s currently possible, while providing operation at lower cost. The development and application of the PCS algorithm to these detection systems led to an award for outstanding service in support of the mission of the Domestic Nuclear Detection Office (DNDO). The award was presented during a ceremony at the 2014 Symposium on Radiation Measurements and Applications (SORMA XV). PSI has recently been awarded a prime contract in support of DNDO’s Radiation Awareness Interdiction Network (RAIN) program.